A safe, permanent and nurturing home for every child. 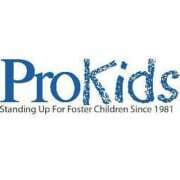 ProKids has been standing up for foster children since 1981. Whether working directly with a child as a CASA (Court Appointed Special Advocate) volunteer, assisting in another capacity, or supporting us financially by making a donation, our children need your help. ProKids trains volunteers to become CASAs--Court Appointed Special Advocates. Each CASA is assigned to a foster child, making sure the child is safe, that the child's needs are met, and helping each child move into a safe, permanent, and nurturing home as quickly as possible. And they're successful. A national study shows that children with CASA volunteers spend less time in long-term foster care and move less often. Abuse stopped for 98 percent of the foster children served by ProKids in 2014. Since 1981, ProKids CASA volunteers have been speaking out for these most vulnerable children and helping them find safe, permanent and nurturing homes. ProKids is so effective in improving the life of child it is a joy to be a volunteer there. If you really want to have a dramatic and continuing positive effect in the life of a child, join me now as volunteer CASA. There are children waiting and needing your few hours a week.